It’s easy to try out many different waffle recipes when you’re using a great waffle maker. Before trying something too fancy, you need to master the art of making the perfect basic waffle. These simple waffle recipes will help you to make golden, fluffy, crunchy waffles with a mouthwatering aroma, and you can hone your waffle-making skills while you are making them. 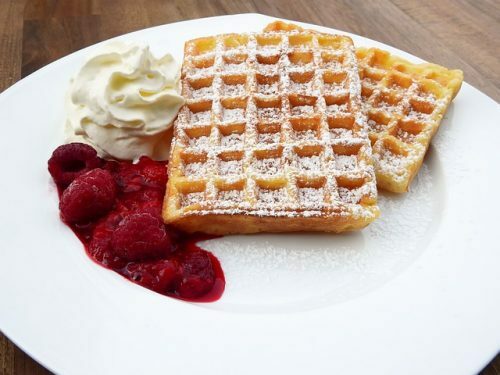 The waffle is the favorite breakfast food for lots of people. It can be served with a number of savory dishes and main courses and is also a great choice for dessert. 1. First, you need to put the eggs into a bowl and beat them with a hand mixer until they become fluffy. 2. Once the eggs are fluffy, gently add the flour, milk, oil, sugar, baking powder, salt and vanilla. Beat the mixture until it’s nice and smooth. 3. Coat your waffle iron with cooking spray and allow it to preheat. 4. The best waffle makers have a light to indicate that they are ready to be used. 5. Put the mixture onto the waffle iron once it’s hot and cook it until the waffle is golden brown in color. 6. Serve the waffles while they are hot. To make the waffles, start by preheating the waffle maker according to the instructions provided by the manufacturer. 1. While the waffle maker is preheating, microwave the butter until it is melts. 2. In a bowl, mix the flour, baking powder, salt and sugar. 3. In another bowl, use a hand mixer to beat the milk and eggs together. 4. With a whisk, slowly add the milk mixture to the dry mixture. Mix until the wet mixture and dry mixture are combined. 5. Stir in the melted butter. 6. Brush the hot waffle iron with additional butter. 7. Put half a cup of batter in the waffle iron at a time. Close the iron and allow the waffle to cook. 8. There is often a light on the waffle maker to indicate when the waffle is done. 9. A finished waffle should be golden brown in color. 10. Remove the waffles and keep them warm until all of them are ready to serve. Check out our Belgian Waffle Maker Reviews. Fist heat up the waffle iron according to the directions provided by the manufacturer. 1. While the waffle maker is heating up, mix the flour, baking powder, salt and sugar in a large bowl. 2. In a separate bowl, beat the eggs, oil and milk together with an electric mixer. 3. Slowly add the wet mixture to the dry mixture and mix well until they combine. 4. Put a little bit of the mixture into the waffle iron and cook it until the waffle is a golden brown color. 5. For most waffle makers, this will take around 3 to 4 minutes. 6. Serve the waffles while they are still hot and fresh, right out of the waffle maker. 7. This basic waffle is a treat for the entire family. These three waffle recipes are great for beginners and for those looking for a basic waffle recipe. Waffles can be topped with a number of different things including syrups, peanut butter, jam and many other toppings. Besides using different toppings, it’s easy to try out variations of these recipes. For example, you can add some cocoa powder to make chocolate waffles. You can add different berries including blueberries to make blueberry waffles. You can also add chocolate chips, sprinkles and many other sweet add-ons to the basic waffle recipe. These basic waffle recipes are easy to make and they use common ingredients that are found in most homes. You only need basic supplies and the only extra thing that’s needed is the waffle maker. These simple and easy-to-follow recipes will help you to make scrumptious waffles. You can serve fresh waffles right out of the waffle maker in a jiffy. There’s nothing like a freshly-made waffle.